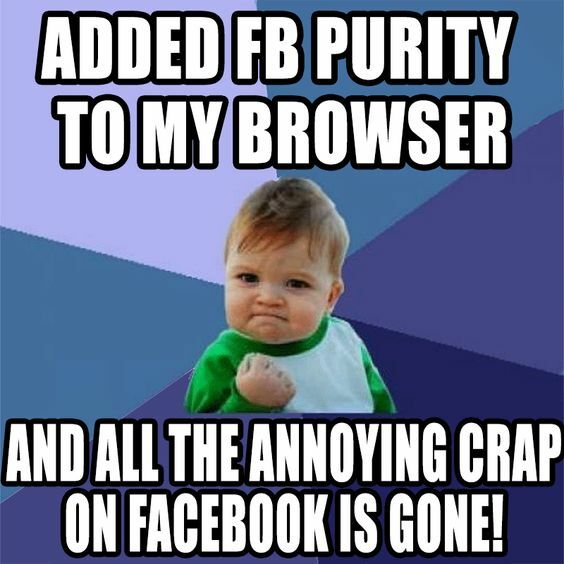 FB Purity lets you clean up and customize Facebook. Helping you to neutralize many problems of the problems as seen in this funny video. Fixed: hidden FBP link in top nav bar as it was hidden for some users. New: Added an option to hide “Live Video” stories from the newsfeed. (Live video posts start with the text “person x is live now” or “person x was live”. The option is under the “Video Stories” heading. 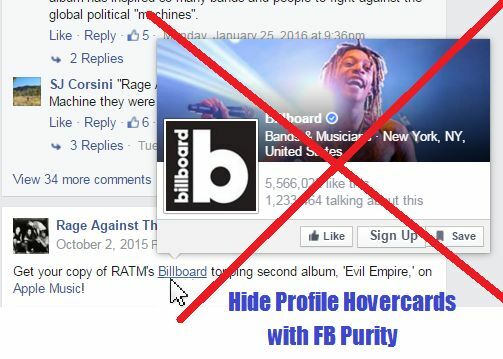 Please note that Live Video posts from celebrities are posted by a Facebook App called “Mentions” so they will be filtered out by FBP’s Game & App filter option. If you want to see posts from the “Mentions” App, you just need to whitelist it. You can do this by adding the Application ID for Mentions: 800871226593160 to the FBP “App Whitelist” manually, or you can click the “WL” link on any posts from the Mentions app that show up under the Apps filter. Please note if you don’t see the option to hide “Live Video” in your version of FBP, you just need to re-install as this was a late addition to FBP 14.2. Updated: Renamed “Trending Articles” newsfeed filter option to “Trending Stories” and fixed it so it filters out trending stories from the newsfeed. Updated: “Fix External links” code to work better. Known Issue: If you have the “Expand News Column” option turned on, sometimes the text in the newsfeed will stretch too far, and go off the screen, I am aware of this bug, and am trying to figure out how to fix it, until then, you can simply turn this option off for the fix. This entry was posted in Facebook, FB Purity and tagged block facebook ads, block live video, change facebook background image, change facebook font, change facebooks colours, clean up facebook, create facebook themes, Facebook, facebook customizer, facebook purity, facebook themes, FB, FB Purity, fluff busting purity, hide all facebook ads, hide facebook ads, hide facebook hovercards, hide facebook live, hide facebook tag suggestions, hide hovercard popups, hide hovercards, hide live video, hide profile hovercards, hide shared photos, live video, remove facebook ads, restyle facebook. Bookmark the permalink. Hey Steve, thanks for the update. Do you think it will be possible to make an option how to set “most recent” comments as default (as in the case of posts in news feed)? The default now is “top comments” so sometimes you have to switch to most recent to see all of the comments because even you click on see more comments, you are not able to see them if you don’t choose most recent comments. anything is possible in theory. but this is not something im planning on doing.